• Ads appear as a 160px square and can link to your own external site. • Our adverts are booked by 4week, 8 weeks, 12 weeks, 6 months or 12 months periods. • Ads rotate with each click or refresh of the page, all advertisers receive equal exposure. 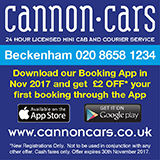 • Advertisers will also be promoted through our @beckenham_forum twitter feed (2000+ followers) & Facebook page. You’re advert will then go “live” on receipt of artwork & payment. We also produce 2-3 minute videos – £300 including all filming & editing. Founded in October 2016, the Beckenham Forum is an online meeting place for the residents of Beckenham to share their knowledge and experiences of life in the area. The Beckenham Forum is not a faceless franchise based in California, we are a local couple living in Village Way, Beckenham. We created the forum because we believe that being part of a community makes living somewhere much more enjoyable. An online community is something you can use where and when you want to. New Features and how to upload images to your posts.